R. John Buskowiak, whose CCC service was interrupted to finish his senior year in high school, was grateful for the maturity he gained in the CCCs. My days in the C.C.C. 's cannot be expressed in words. You have to live it in the mind of an 18 year old boy. I must say it taught me the respect of authority, of individual responsibility, how to work and get along with others. My days in the C's developed me into a man. I will always have the highest respect for the Civilian Conservation Corps. They should have the same thing today for the youths of our society. 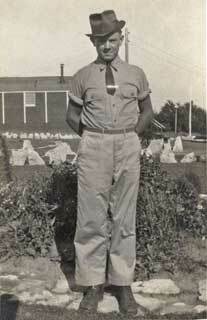 John Buskowiak at CCC Company 713, Lake City, 1940. 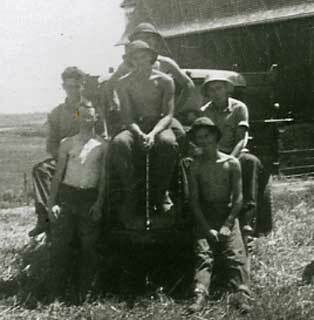 Fencing crew at Plainview, CCC Company 2709, 1938. 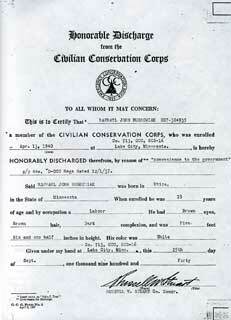 R. John Buskowiak's CCC Discharge Papers, April 13, 1940. 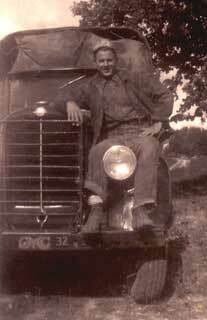 John Buskowiak with his truck, CCC Company 713, Lake City, 1940. Photo: R. John Buskowiak, 1995. 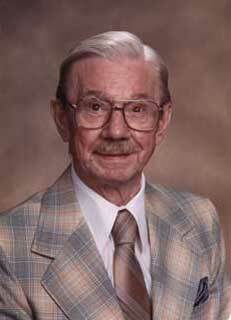 Buskowiak, R. John, My Days in the C.C.C.’s. MHS Manuscripts Collection, 1993.